Enjoy a tranquil escape in the city, with a complete body contouring treatment. Essential oils with massage are aimed to invigorate, relax and refine the skin. Mineral clay is then applied to multiply the positive effects of the oil. Benefits include smoothing and firming areas prone to cellulite, while aiding the body’s natural elimination of toxins.Customized treatments 1 hour $100.00 are available for either Anti-Cellulite or Toning & Firming. Full Body Brush to polish the skin, remove built up, increase circulation and lymphatic flow. Treatment is complete with a European relaxation massage. 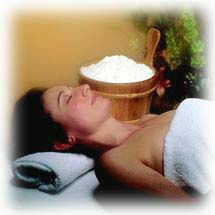 Full body exfoliation to stimulate circulation and moisturize the whole body using essential oils. Great for relief of stress. Email: info@ambiancedayspa.ca © 2002 ambiancedayspa. All Rights Reserved.